What is Artificial Intelligence? Why would we use Artificial Intelligence in Ecommerce? Thanks to Hollywood, when most people hear the words “Artificial Intelligence”, they think about the Terminator movies and the rise of AI, how Skynet tries to enslave humanity and how Arnold Schwarzenegger is sent back in time to save Sarah Connor and using the phrase he is famous for “I’ll be back”. Artificial Intelligence, sometimes called machine intelligence, is intelligence demonstrated by machines., in contrast to natural intelligence displayed by humans and other animals. Basically, it can be any device/programme that perceives its environment and takes actions to maximize its chance of successfully achieving its goals. 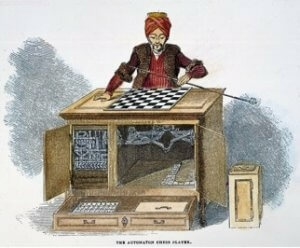 For centuries, humans have tried creating intelligent machines, we have records dating back to the 18th century when Wolfgang Von Kempelen built the first chess machine called “The Turk”. It won most of the games it played during its demonstrations around Europe and the Americas for nearly 84 years. Playing and defeating many challengers including statesmen such as Napoleon Bonaparte and Benjamin Franklin. In the end, it turned out that the Turk was a mechanical illusion that allowed a human chess master hiding inside to operate the machine. Machine learning (1980’s) – this is when computers began to learn without being programmed, meaning that a single algorithm learns from past experiences and had data fed to it by humans. 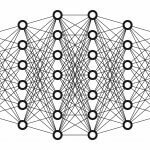 Deep Learning (2010 and onwards) – programs start to mimic the way in which the human brain works, AI systems can be trained to predict outputs given a set of inputs. Deep Learning and Machine Learning are what make Artificial intelligence invaluable for Ecommerce because they can analyze customer data and anticipate the customer’s needs thus allowing a more personalized shopping experience. So what uses are for all this? Machine learning drives the algorithms which allow the Ecommerce provider to predict what other products would most likely interest customers and provide customized recommendations based on the customer searches and previous purchases. It has been estimated that about 35% of Amazon’s sales are driven by its recommendation engine. 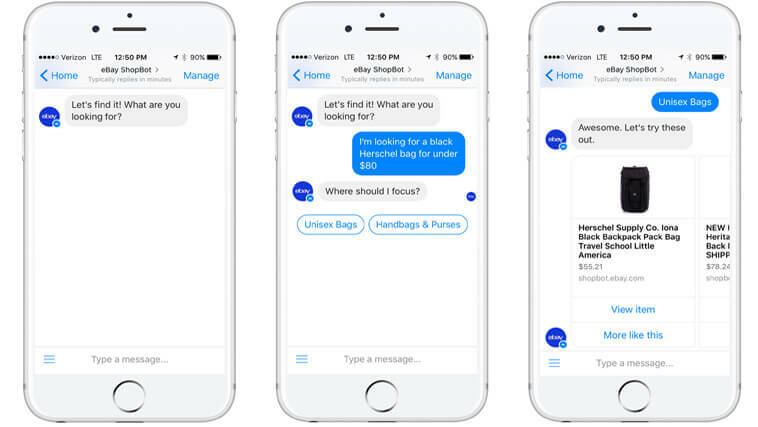 A good example here would be the eBay Shopbot, a chatbot that can be accessed through Facebook messenger which was first launched in 2016. The bot functions as a personal assistant and helps users easily find the items they are interested in. The users can communicate with the bot using text, voice or pictures taken with their smartphones – of products that might interest them. There are no official records of any drive in sales caused by the chatbot, but eBay is using machine learning as an integral component of its business strategy. Another good example would be Alexa – Amazon’s most popular AI product. 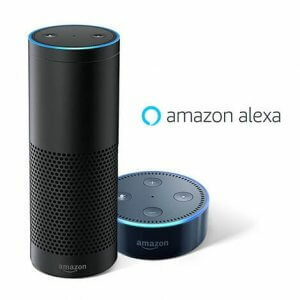 Alexa helps driving the algorithms that are essential to Amazon’s targeted marketing strategy. Anyone can add products to their shopping cart using voice commands – making the shopping process seamlessly easy. Since Alexa is present almost everywhere – thanks to smart devices – customers can order products online from the comfort of their bed. These automated logistics centers improve the company’s capacity to process orders and product shipment speed. These robots are responsible for handling parcel sorting, they help humans to select the products that are part of an order. These warehouses are also referred to as “hives”, because they are populated by hundreds if not thousands of robots (just like bees in a beehive), these bots are not intelligent on their own. They are controlled by a central computer that coordinates them with pin-point accuracy, if one of the bots breaks down, one of the other buts can easily take its place and continue doing its work, meaning that the warehouse won’t lose any of its efficiency. The use of Artificial Intelligence in Ecommerce has become inevitable because, in an ever-changing world, innovation is the key to staying relevant. AI is emerging in the Ecommerce segment of the retail industry and is being applied across multiple areas including processing customer service inquiries, product packaging and delivery, and internal operations. Thanks to the advances in technology, orders can now be processed, selected from a warehouse and shipped within hours.